FREE TwoMorrows stuff for Free Comic Book Day! This weekend, we’re celebrating Free Comic Book Day by offering FREE publications, both in comic book stores worldwide, and online at www.twomorrows.com. 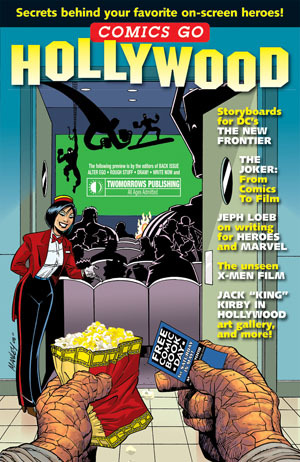 On Saturday, May 3, 2008, our new COMICS GO HOLLYWOOD publication will be available free of charge at comic book shops. 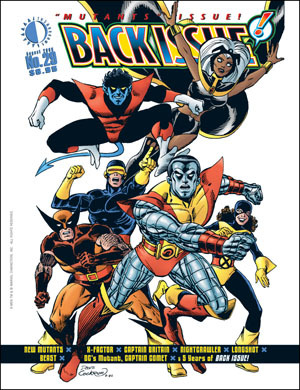 This 32-page comic-size book was assembled exclusively for Free Comic Book Day by our regular magazine editors, and reveals secrets behind your favorite on-screen heroes, and whatâ€™s involved in taking a character from the comics page to the big screen. It includes storyboards from DCâ€™s animated hit â€œThe New Frontierâ€ (courtesy of DRAW! magazine), JEPH LOEB on writing for both Marvel Comics and the Heroes TV show (courtesy of WRITE NOW! magazine), details of an unseen X-Men movie (courtesy of ALTER EGO magazine), a history of the Joker from his 1940s origins to his upcoming appearance in the Dark Knight film (courtesy of BACK ISSUE magazine), and a look at Marvel Universe co-creator Jack Kirbyâ€™s Hollywood career, with extensive Kirby art (courtesy of my own JACK KIRBY COLLECTOR magazine). This one-shot sampler of our magazine line is also available in print form free from our website (a shipping charge applies), or as a free downloadable Digital Edition just by logging in and adding it to your shopping cart, and checking out. Also, last year’s FCBD publication, COMICS 101 (featuring how-to and history lessons from top comics professionals) is also available for free in print or digital form at www.twomorrows.com. We’ve also added several new Digital Editions of past issues of our magazines (each available for $2.95 per download), just in time for the FCBD event, and the newest episode of the TwoMorrows Tune-In podcast (hosted by Chris Marshall) has just debuted, featuring behind-the-scenes info on our upcoming publications. So be sure to go to your local comics shop, and stop by our website and load up on free stuff! This entry was posted in TNT on 2 May 2008 by Mr. Morrow.